David sits in his car, sick to his stomach and barely able to order his thoughts, but determined to record his statement of events. His wife, Elle, hovers over her lifeless body as it lies on the laundry floor of the house they shared. David thinks back on their relationship – intimate, passionate, intense – and what led to this violent endpoint. Elle traces their shared past as well and her version of events gradually reveals how wrong she was about the man she’d loved. 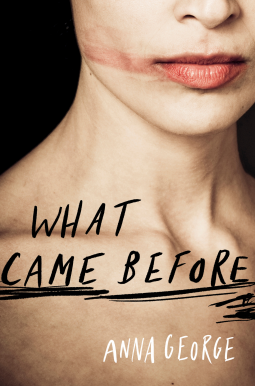 Dark, atmospheric and gripping, What Came Before is a stunning literary thriller about the risks you take when you fall in love. After reading this book the hardest question I must ask myself is which part of me responds to this book and therefore determines how the review will be written; is it the view point of a Women’s Studies Graduate (B Soc Sc), is it the view point of a once upon a time worker in a Women’s Refuge, is it the viewpoint of a worker in the Film and Television Industry, is the view point of a passionate crime fiction/psychological thriller reader or the view point of a modern mature woman who has experienced some of the manipulation and violence described in this novel? I think the answer to this question is a complicated one but I guess I will write a little from all perspectives and maybe a whole lot about how I responded to this brilliant expose of domestic violence and *limerence which coincidentally is the title of the film Elle writes in this novel – her story one of a of life imitating film… the script Dave helped to create. Anan George writes a compelling narrative about spinning out of control with the giddiness of love; the type of love written about in romance books, portrayed on the big and little screen, of intense attachments and the willingness to suspend any doubts or faults of the person you attach the limerence to- besotted, infatuated, devoted…in love… doesn’t begin to describe the intensity of the feeling that you need to be reciprocated. You cannot survive without your partner and when cracks in the relationship start to show you work hard to cover them up and believe you can help mend these ugly traits. You ignore the little warnings, hairs that rise on the back of your neck, the words spoken harshly or loudly, the grip on your arm… the simmering below the surface barely controlled violence you can feel – you tell yourself you can change them (you can’t), you blame yourself for causing the black moods (you didn’t), you look for excuses to tell yourself or try to placate the violator and try and diffuse any anger before it explodes; you become responsible for his rage (how can that be?). Eventually the limerence fades and you are stuck in a relationship that most find hard to escape without help – and the violator has already done a really good job of isolating you from your friends and support networks – work and personal and has brow beaten your self-esteem to a tatter, all that is left is an unravelling thread…Such is the love Elle feels for Dave. Such is the damage he inflicts upon her. To say this is a powerful emotional read is an understatement. To say this is a powerful psychological thriller is simply stating the truth. Anna George generates such authentic voices in the voices of Dave and of Elle; the script between them, internalised and spoken is so potent and accurate the hairs on the back of my neck were standing up! These two characters are intricately and vibrantly drawn. Thorough this narrative we experience some very poignant revelations and some very clever use of stories within the story; Elle reads a book by Katherine Hepburn who painfully disclosures her own sad relationship with Spencer Tracey – a love that diminished her sense of self; “after almost three decades with Spencer Tracy, the great Kate hadn’t known why she stayed with him. She hadn’t known his feelings for her. But she’d tended to him happily and tried hard not to ruffle him. She’d even tried to forsake some of her best qualities because she suspected he didn’t like them. Because what they had, for her at least, was bliss.” Elle eventually recognises that she too has surrendered her own sense of self to appease her husband and subdue the menace that lives within him. Her film now imitates the life she now has – of two dancers out of sync, out of step… involved in a dangerous dance. Elle’s life, like so many others, is one where domestic violence is a lesson learned firsthand. As Elle states; “She was taught nothing of the risks posed by those who claim to love you, the risks that manifest at night in family kitchens, or after the party. It would have helped, she thought, if someone had explained the warning signs: the mood swings and outbursts. And what they were; covert attempts to control. Then she could have had a language and a context for how she felt today. Better she would have been forewarned.” Thanks Anna George for opening up this dialogue, for giving us words and language and emotions and consequences that enable such conversations to be had. Back to the book- a stunning cast, a wonderfully complex plot, a few twists and turns and a surprise ending; drama, tragedy, love, marriage, death, violence- real and perceived …dark and atmospheric, this book has it all and shares it’s story powerfully and honestly. *Limerence is an involuntary state of mind which results from a romantic attraction to another person combined with an overwhelming, obsessive need to have one’s feelings reciprocated. The psychologist Dorothy Tennov coined the term “limerence” in her 1979 book Love and Limerence: The Experience of Being in Love to describe the concept that had grown out of her work in the mid-1960s, when she interviewed over 500 people on the topic of love. 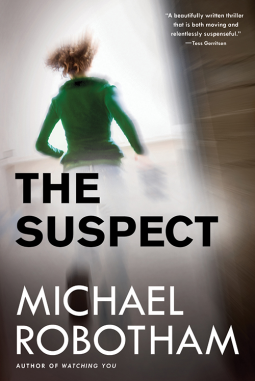 Please join us in welcoming The Suspect in paperback—at last! Renowned psychologist Joseph O’Loughlin has it all—a thriving practice, a devoted, beautiful, fiercely intelligent wife, and a lovely young daughter. But when he’s diagnosed with Parkinson’s, O’Loughlin begins to dread the way his exceptional mind has been shackled to a failing body, and the cracks in his perfect existence start to show. At first, O’Loughlin is delighted to be called in to a high-profile murder investigation, hoping his extraordinary abilities at perception will help bring a killer to justice. But when O’Loughlin recognizes the victim as one of his former patients, an emotionally disturbed young woman who nearly brought ruin upon him, O’Loughlin hesitates-a fateful decision that soon places O’Loughlin at the top of the lists of both a bullish detective, and a diabolical killer. Do you know that feeling you get when you pick up a book and start reading it and instantly you know the author can write? Well this book showcases the writing skills of Michael Robotham so well! The narrative is credible, intelligent (treats the reader with respect), doesn’t ask you to go along with ludicrous situations, it has great character development, and a plot that twists and turns and surprises. I am so pleased I have been properly introduced to this series (I read the 7th book in the series, Watching You, first) and it was a cracker of a read. So now I am having a proper introduction to the characters and the writer by starting at the beginning of the series. And what a great series it is (I have just finished #2, more on that soon) I love the main characters; natural, flawed but not sullen or drunk or self-loathing pessimists – characters you can grow with, want to read more about, empathise with. I look forward to reading all the book in this series and anything else Michael Robotham writes. A serial killer’s work goes unnoticed until Detective Berlin is on the case in this third spine-tingling Charlie Berlin novel. It’s 1967, the summer of love, and in swinging Melbourne Detective Sergeant Charlie Berlin has been hauled out of exile in the Fraud Squad to investigate the disappearance of a teenage girl, the daughter of a powerful and politically connected property developer. As Berlin’s inquiries uncover more missing girls he gets an uneasy feeling he may be dealing with the city’s first serial killer. Berlin’s investigation leads him through inner-city discothèques, hip photographic studios, the emerging drug culture and into the seedy back streets of St Kilda. The investigation also brings up ghosts of Berlin’s past as a bomber pilot and POW in Europe and disturbing memories of the casual murder of a young woman he witnessed on a snow-covered road in Poland in the war’s dying days. As in war, some victories come at a terrible cost and Berlin will have to face an awful truth and endure an unimaginable loss before his investigation is over. 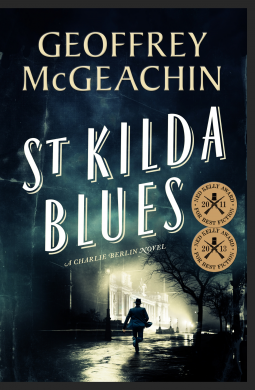 St Kilda Blues is Geoffrey McGeachin’s seventh book and third in the Charlie Berlin series. The first Berlin novel, The Diggers Rest Hotel, won the 2011 Australian Crime Writers Association’s Ned Kelly Award for Best Fiction with the follow up book, Blackwattle Creek, also winning the Ned Kelly Award for Best Fiction in 2013. This is my first foray into the work of Geoffrey McGeachin and now have dipped my toes into the work of this 5 star crime writer I am ready to plunge in and read his other works! This narrative has superb settings; the late 60’s early 70’s vibe and voice is authentic with meaningful references to the popular culture and social movements of the era. Scarily frightening is the almost low key, matter of fact presentation of life post war London and the life and times of child migrants heading to Australia and the unfortunate experience so many encountered at the hands of religious institutions – abuses that are just seeing the light of public reaction now. McGeachin’s low key descriptions and statements somehow conjure up images of depravation without being sensational and this gives the reader powerful insights without personal emotions tangling the view; very well presented. Then there is the chilling depiction of evil that is the antagonist in this narrative – this voice scared me; a true sociopath and monster. The dual perspectives, that of Charlie Berlin, our protagonist, alternating against the view point and story of the antagonist was a brilliant move. There was some light relief to be had in reading the alternate voice of humanity – with all its foibles, in the character of Charlie Berlin; a perfect foil to our villain. The back story was interesting, absorbing and presented many moral and ethical dilemmas and is left unfinished which leads me to hope that another episode of the Charlie Berlin narrative is planned. Four-year-old Nathan Fisher disappears from the bank of a rocky creek. Did he drown or was he taken? The search for the missing boy grips the nation. A decade later, young teen Adam Vander has grown tall enough, strong enough, to escape his abusive father. Emerging from behind the locked door of their rambling suburban home, Adam steps into a world he knows little of. In the days that follow, with the charismatic and streetwise Billy as his guide, Adam begins to experience all that he’s missed out on. And he begins to understand that he has survived something extraordinary. As the bond between the boys grows, questions begin to surface. Who is Adam really? Why was he kept so hidden? Was it just luck that Billy found him, or an unsettling kind of fate? Unearthing the shocking truth of Adam’s identity will change the lives of many and put at risk a cast of flawed, desperate people. It’s a treacherous climb from the darkness. For one boy to make it, the other might have to fall through the cracks. This was a very hard read- the subject matter is very very distressing yet somehow captivating at the same time, it is so well written. This narrative will eat away at your very core, demanding you pay attention to those you value and love, demanding you pay more attention to those who are vulnerable in your community. This novel shouts – pay attention, open your eyes, question and engage; life around you is your business and you do have a social responsibility that extends further than your garden fence. Is it a coincidence that the subject of this novel, abuse of children, is currently making headlines, is newsworthy – though already the media seems to be moving on to other things…This subject requires our undivided attention. It requires our compassion and the children involved our full support and love. This extremely well written and engaging novel will not be for everyone. Bravo Honey Brown for being brave enough to tackle such a disquieting subject and presenting it such an engaging way that it will get the attention it deserves. This novel is a well-crafted, complex and powerful snap shot of the ugly side of modern society. This novel kept me awake long after I finished reading it- it was disturbing and sad and yet still managed to garner some hope for the future. This is my first read of a Honey Brown novel – it will not be my last. A hilarious novel about hitting rock bottom and climbing back up again. Chelsea has had a rough week. After a few great years of professional triumphs and personal stability, she suddenly finds herself—at the grand old age of 28—homeless, jobless and single. Cheating on her boyfriend with her boss probably wasn’t the brightest idea. Salvation comes in the form of her father, Gary ‘Turbo’ Turbiton, a once major but now fading star of stage and screen, who offers her a job as his assistant while he travels Australia promoting his recent autobiography. Chelsea adores her Dad but she knows from years of family road trips just what this ‘job’ will entail: hours and hours of mindless bush trivia, pit stops to ridiculous local landmarks and pointed interrogations about what she’s doing with her life. All the while John Denver will warble endlessly on the CD player. Resigned to her fate—and without a better offer—she says yes. The promo tour takes the two of them across Australia—from a family wedding in Darwin to a pig farm in Port Fairy, from a chance encounter in Tenterfield to an impromptu karaoke night in Yackandandah. Along the way there are unplanned detours—and people—they have to face as they both struggle with that eternal life question: what happens next? 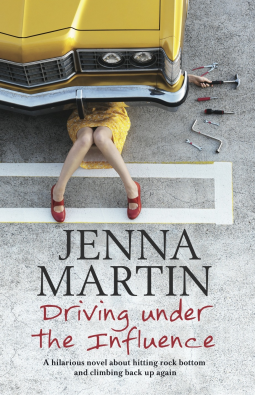 With its light touch and sassy humour, Driving Under the Influence is a charming look at growing up, growing old and what fathers and daughters can learn from each other. Jenna Martin has been a teacher in Sydney, a law student in Wollongong, an actor in London and a film producer in Los Angeles. She has written several plays, screenplays, short stories and the occasional bad love letter, and this is her first novel. This is a delightful debut novel about one woman’s life changing journey during a road trip with her famous father, stopping to see various lunatic relatives and landmarks along the way; full of reminiscing, hope, love and laughter this book will hook you in and before you know it you will be smiling and laughing out loud. This read is so enjoyable! I don’t know if it my association with the film and tv industry( my workplace of the last ten years) or the familiarity of certain situations or certain types of people that drew me in or if it was the larger than life father figure – Turbo to his fans and family, who had me trying to guess who he could be modeled on – I was imagining all sorts of tv presenters and the odd actor who could fit this profile, or mixes of them, (sorry Jenna I have just come across info alerting me to your famous father – and I didn’t think of him , not even for a minute) anyway I was intrigued, I was engaged in this madcap romp, I was besotted with your characters… or maybe it was the opportunity to step back in time when you reminded of fashions, music, shows, friendships, relationship issues, adolescent dreams and tribulations, and other contemporary references about family and growing up, whatever it was I laughed and laughed and laughed. This is a book written with passion and laughter…you can feel the vibes come off the pages; a great piece of Aussie light hearted fiction. Full of surprises, wonderful insight, humour, a poignant country side, a flowing memorable narrative and rich likeable characters, this novel has it all! 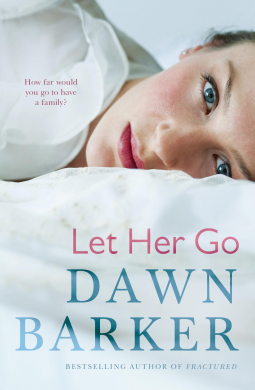 She retreats to the family’s only asset – a freehold block of land owned jointly by her eccentric father-in-law, Quinn. In the valley at Evergreen Springs, Quinn hopes the fractured family might all come together to start over again. Life in Queensland’s far north is wildly unpredictable, with daily challenges and the wet season, in all its wild majesty, to survive. But when twelve-year-old Rob makes the gruesome discovery of a dead body in the valley, real peril comes far too close to home. Tracking North is a beautiful family story about life in the stunning Gulf Country, one of the world’s most unique and fascinating places. I was both surprised and delighted by this novel – the settings are superb; McGinnis writes with a rich colourful palette bringing to life the rugged rural lifestyle of cattle country in Australia’s north, portraying the hardships, the isolation, the Wet Season and the stamina and strength of the women living and working in these remote regions. The women in this novel are the true heroes; supporting their families, educating their children (with the aid of the School of the Air), living in isolated communities, working on the station and dealing with the change that is modern farming. Tracking North is a fitting tribute to all women who have worked/work now in the bush/on the farm. 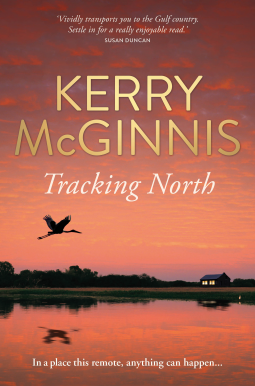 But Tracking North is more than just a story with beautiful settings and heroic women; it is a narrative that is written with passion and love, the words flow, unable to be constrained by the mere page, blossoming with wit, humour and such wonderful insight about love, life, family relationships and growing up. I have never come across a contemporary work of fiction that has had me itching to turn the page, reading till early hours of the morning…such is the power of this narrative; engaging and mesmerising. McGinnis has a great command of language and is able to make her characters and their conversations step of the page onto the stage. I particularly enjoyed the old canny grandfather, Quinn; full of quiet wisdom, with a wonderful sense of humour and with the powerful motivation of seeking redemption, he transforms this narrative into more than a rural romance. This novel is a delight to read. And I just loved the cover art!